Near the library’s entrance resides a newly installed steel bike rack that has been an anticipated addition to the community. Constructed of black mild steel, the rack has two posts incorporating plaques that have John and Kathy’s name on each side. It is cohesive with the library’s architecture and is likely to be missed by the unknowing eye. The rack, which can hold roughly 17 bikes, according to Zino, has intricate detail that emphasizes the neoclassical aesthetic throughout Haddonfield. Stuart Harting, the chair of the Haddonfield Outdoor Sculpture Trust who was responsible for choosing the sculptor, expressed his desire to work with Dailey, an artist in Philadelphia, after seeing some of Dailey’s work and admiring it. Dailey collaborated with the library and the trust to find a cohesive layout for the bike rack. “It was my desire to make something that speaks to the architecture to the building,’’ Dailey, a graduate of The Pennsylvania Academy of Fine Arts, said. After being a professional artist for six years, Dailey was able to successfully design and fabricate the rack in a matter of four to five months. Despite looking like one unit, the piece was assembled from various parts, formed together like a puzzle. From designing to cutting the pipe and welding, Dailey did it all. 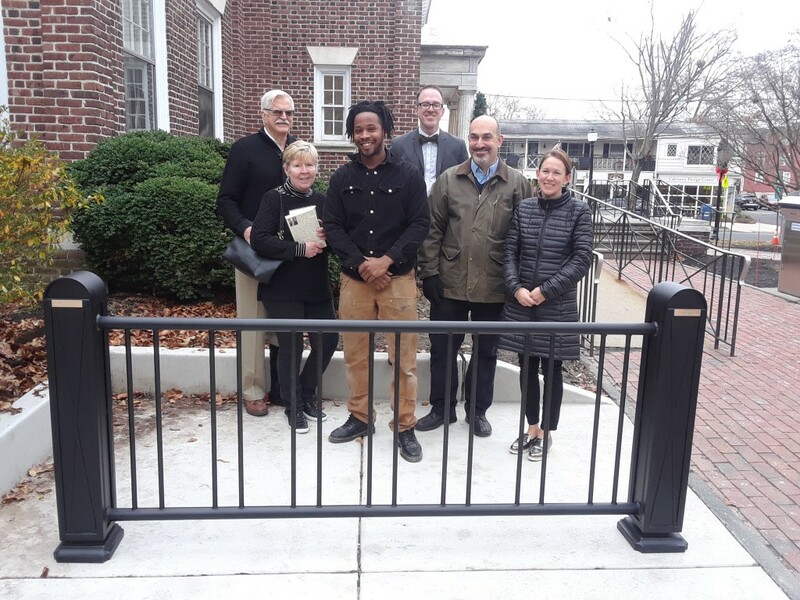 The rack is not only an eye-catching addition but necessary for community members who use a bicycle as a form of transportation, especially in Haddonfield. The usefulness ties in with the artistic touches, and although the average passerby may not notice the unique details of this new addition to Haddonfield, upon closer inspection, residents can see the thoughtful details included within every inch of the piece. “The art is the most important thing we are putting here to differentiate us from the other bike racks,” Harting said.